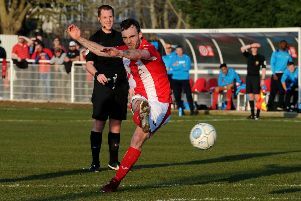 Brackley Town entertain Sky Bet League Two side Newport County in Sunday’s Emirates FA Cup first round tie and Kevin Wilkin’s feat of taking Wrexham to the third round last season will give his side confidence. The tie is all-ticket and Saints will be looking to do what they did to Gillingham two years ago when they knocked them out in a first round replay. Back in 1981 Sunday’s opponents Newport reached the last eight of the European Cup Winners Cup losing to Carl Zeiss Jena of East Germany in their quarter-final tie. Meanwhile, Wilkin came within ten minutes of knocking Stoke City out of last season’s FA Cup competition. Wrexham were leading the Premier league side 1-0 at the Britannia Stadium before losing 3-1 in the third round tie. The Conference side led through Mark Carrington in front of 5,000 travelling Wrexham fans but Marko Arnautovic equalised and Stephen Ireland scored twice to save Stoke’s blushes. Wilkin said: “That was a great moment for me in the competition, to come within ten minutes of beating a Premier League side. “It’s a great competition and the biggest financially for a club like ours. “We will approach the tie in the same way we do any game apart from having an extra day’s training because the game is a day later. Wilkin received a double boost this week. Oxford United have given permission for Aidan Hawtin to play and Cambridge United are allowing striker James Akintunde to do likewise.